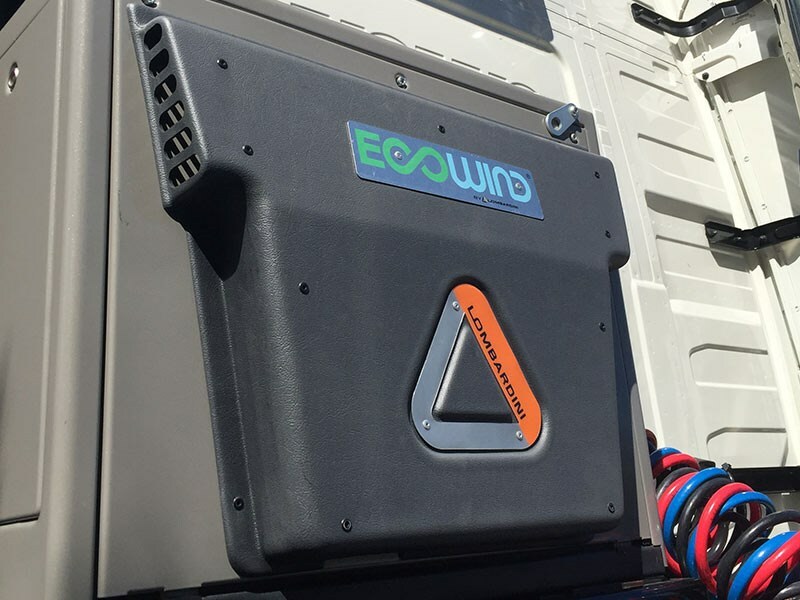 A diesel powered “Ecowind” system on the ATA’s Volvo safety truck. Cool guy: Truck Art’s Terry Gibbs. A roof-mounted Viesa near the roof in Truck Art Wagga’s office. Truck Art at the very hot interstate crossroads in Wagga Wagga. Independent batteries for a “Koolkat” refrigerative system. A Koolkat refrigerative air-conditioning system. Underneath that cover is the Viesa evaporative system’s water tank. Relief from the heat: the Viesa outlet inside the cab. Perhaps surprisingly, truck manufacturers don’t supply factory-fitted bunk coolers for Australia, and there’s no peak body for after-market bunk cooling suppliers. So we visited supplier Truck Art at Wagga Wagga in southern NSW on the crossroads between Sydney, Melbourne, Adelaide and Brisbane. Believe me, it doesn’t get much hotter in Australia than in Wagga. Truck Art owner Terry Gibbs also has cooler installation workshops in Adelaide, Melbourne and Perth. One of his early ventures was manufacturing sleeper cabs in the days before widespread bunk air cooling, about 15 years ago. "It was a no-brainer for me to see the industry needed something in the sleeper cabin," says Terry, who sold his first Viesa to Paterson’s Transport at nearby Narrandera. "I still remember the driver, he was an older bloke, coming in after it had been fitted and thanking me, and he said ‘This is the first time in my life that I’ve been able to have a proper sleep in the summer time’." "It wasn’t long before people had to have it, and I think the main thing is it was fatigue management … and that helps overall with insurance costs because tired drivers have accidents. "Drivers expect it today. Once it was a luxury but now they need it and not only that, I think if there was an accident due to a man not sleeping, and he didn’t have air cooling, the company could have something to answer for." Truck Art’s cheapest product is the evaporative Viesa cooler, manufactured in Argentina and a common sight on Australian roads these days. They are priced at up to $3,600 installed, with the annual service to clean the filters and so on costing about $150. Terry says that contrary to some opinion, the small amount of humidity can’t possibly rot the cabin; the water drains back into the tank on the back of the cab when not in use; and the unit can’t run the truck battery flat because there is a cut-off mechanism when the voltage gets too low. He says of course there can be problems with cool air quality and quantity if Viesas aren’t cleaned for four or five years, "which we often see". There seem to be several advantages of an evaporative system over the next one up in the pecking order – a battery operated refrigerative system, such as the "Pure Air" or "Koolkat" which Truck Art supplies. Terry says a Viesa uses only 8 amps of power per hour, and will give the driver a sleep on a very hot day by at least blowing moist air over them. On the other hand a battery refrigerative system draws lot more power and may not be able to overcome an extremely hot day at all. These can run for between four and seven hours depending on how hard the compressor is working, and Terry says they are best suited to night time or a few hours during the day. 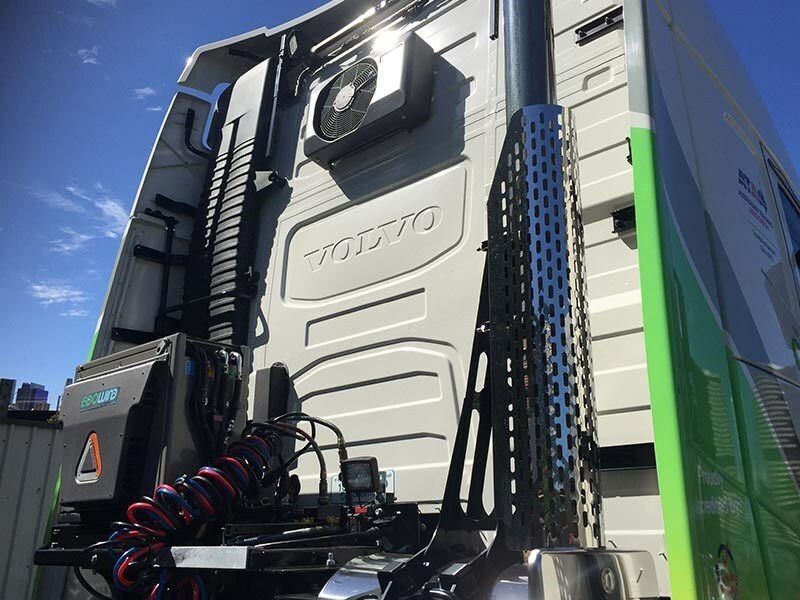 They cost from about $5,000 to about $9,000 for a unit with its own batteries and which is big enough to cope with a big-cab Kenworth for half the day in the sun; and they are more expensive to maintain than evaporatives, for example with gassing. "It’s horses for courses and some people love them," Terry says, adding the truck needs to be driven for as long as the aircon has been running, to charge the batteries, whether the unit runs off the truck or is independent. Top of the range of course is diesel powered refrigerative air-conditioning, such as the well-known "Icepack", which now offers a 1,000 hour extended service interval. Truck Art’s offering is the "Ecowind" with single cylinder Lombardini engine using about 700ml of fuel an hour, and costing between $10,500 and $13,000, depending on where on the truck it’s fitted. The Australian Trucking Association’s Volvo "safety truck" runs one of these. As the ATA points out, in 2013 after its lobbying efforts the Tax Office ruled that the fuel used in truck sleeper cab air conditioners is now tax free. As a result the ATA estimates trucking businesses could save up to $300 per truck per year. Diesel powered units can pump out cold air indefinitely if need be, regardless of the outside heat, but of course their downside is noise for other truckies trying to sleep nearby. The Ecowind is relatively quiet at 60 decibels but Terry acknowledges the noise issue is becoming a problem. "We are finding in certain areas now, especially up towards Queensland, there are service stations with signs saying you are not to run air-conditioning motors when you’re stopped." The bottom line from all this on sleeper air cooling? "There’s no perfect product out there yet." Check out the full feature in an upcoming issue of Owner//Driver. Subscribe here.